When it comes to summer clothes, one of our favorite things in our wardrobe is a maxi dress. The popular item rose in the fashion stakes a couple of years ago. And the trend has not died down with this still being a popular option for the summer months. For one thing, a maxi dress can really show off your figure without having to get any of your actual body out. And you can get so many styles when it comes to maxi dresses that it's a great option when it comes to your summer wardrobe. A maxi dress also looks good on curves and slim figures. And whether you are small or tall, you can still pull off a maxi dress. A lot of people make the error of thinking that maxi dresses are just for the daytime. After all, they are ideal for when you are on the beach or walking around the pool. Or even just chilling in your back garden when the sun makes an appearance. But they actually can be fantastic for the evening. In fact, you will look sensational if you do pull out a maxi dress for that evening event. A lot of people worry they are too casual for a party. But there are some ways you can make a maxi dress look a lot more formal. 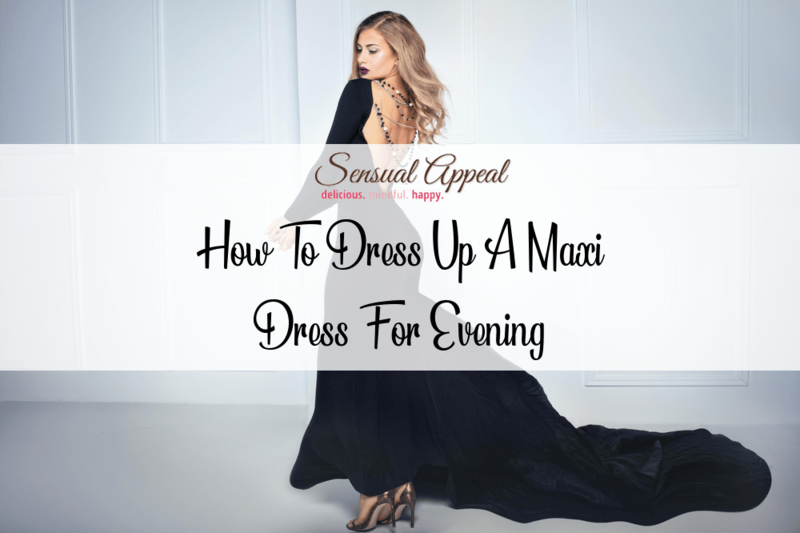 Here are some ideas on how to dress up a maxi dress for evening outings. Related Reading: Check out how to make a bunch of different outfits with the same clothes! A lot of people go for a pair of flats when it comes to wearing a maxi dress. After all, it gives you the ultimate chilled-out look. Or if they are wearing a maxi dress for a meal at a hotel, they might even get out some casual sandals. ​But if you want to really make it a stand out dress in the evening, you should swap to a pair of heels. After all, adding a glam pair of stilettos will really add a touch of fabulous to the dress. It will definitely turn heads and show you are ready for an evening of partying if you do go for heels. Make sure you opt for a color which contrasts well with the maxi dress. After all, you want people to know that you have a killer pair of heels underneath that maxi dress. You might want to go for a dress which is long at the back but opens at the front to expose your legs. That way, you could go for something similar to a pair of lace-up heels. These will really show off your gorgeous pins. And it will look amazing with that cute maxi dress. You might have got a maxi dress which is quite plain. After all, a bold black or deep red maxi dress will look gorgeous. But it's not very dressy if you are planning to go out on the town in the dress. Therefore, you might want to add something to give the dress a new lease of life. One thing you could consider adding is a jacket with the dress. For instance, a blazer or even a short jacket can add some style to the maxi dress. And rather than go for something plain, you should opt for something with a touch of embellishment. That way, you will add a touch of sparkle to that maxi dress. And it can really turn it from a daytime to a night time outfit. In fact, as the lights go down on your holiday, or even as you enter the club, your embellishment will leave you shining like the star you are. Just make sure you don't go too over the top if you already have a pattern to your dress. Otherwise, you will stand out for the wrong reasons. Another thing you can do if you want to jazz up that maxi dress to make it perfect for the evening is to add some jewelry. After all, it can help turn that plain maxi dress into something spectacular. If it's quite a plain color, you might want to add some bright jewelry. For example, you might want to go for something like some brightly colored bangles and a long stunning necklace to go with the outfit. And you could go for some pretty earrings which will also add a pop of color to your outfit. Also, you could add a gorgeous sparkly brooch to the maxi dress. Everyone will cast their eye to the bangle on your dress and it will help it to look like formal wear. As you are trying to make the maxi dress into evening wear, it's also an excellent idea to go for something shiny. This can help you transform the outfit so you look stylish at that evening party. Just make sure that you contrast well when it comes to jewelry. After all, you don't want to go for something which clashes with the prints and patterns of your maxi dress. And don't overload yourself with jewelry. Go for something quite simple which will help you to stand out from the crowd. Remember that a gorgeous handbag can also work wonders to take that maxi dress from day wear to evening glam. Go for a small clutch with a sequin design or even a silver or gold shoulder bag to help you to wow with that maxi dress.